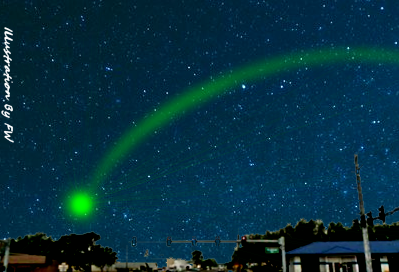 A retired Florida police officer and his wife reported watching a green neon light the size of a traffic signal drop down between buildings and disappear, according to testimony in Case 63887 from the Mutual UFO Network (MUFON) witness reporting database. The witnesses were driving westbound along Nasa Boulevard about 200 feet from the Wickham Road intersection in West Melbourne, FL, at 8:50 p.m. on January 29, 2015, when the incident occurred. “The light was approximately the size of a traffic control signal light but more neon green in color. The light moved like it was a baseball being thrown in an arc and dropped below the buildings on the west side of Wickham Road.” . . .